Rafa Benitez has challenged his Newcastle United players to continue to confound their critics as they attempt to become the Premier League's latest surprise package. The Magpies headed into the weekend sitting fourth in the table after recording three successive top-flight victories for the first time since 2014 and looking to make that four when they travel to Brighton and Hove Albion this afternoon. Some fans have grown increasingly annoyed by the predictions of pundits who have forecast significantly poorer results, but manager Benitez, while knowing tougher times will come, is not at all concerned by that. He said: "The main thing is not what they think or were expecting, it is what we think and what we are convinced that we can do. "The message has to be exactly the same: keep going, keep working hard and we will have more chances to get points every game. "If you said 'are you happy to be the surprise or to be at the bottom? ', I'd rather be the surprise. "We want to win and stay there, and then you will be talking about the Champions League and all these things. "We are realistic. We know it's a question of time before we lose some games. But if we can delay that as much as we can, it will be fine. "Keeping the momentum, keeping the good spirit, I think we can compete against anyone. And then it's football, you never know." 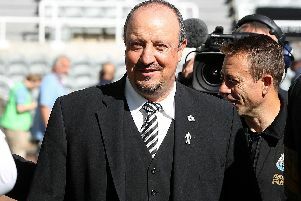 Newcastle's encouraging start has increased optimism that the club can avoid an immediate return to the Championship despite a relatively low-key summer recruitment drive and one which certainly did not meet Benitez's expectations. Nevertheless, he is confident there is potential within his squad, although his first target is the 40 points he believes will ensure their continued presence. He said: "Forty points is a guarantee that you will stay, but I'm not thinking too much about that, believe me. I am thinking about the next win, the next game. "If we can win, another three points; if we cannot, we carry on to the next one." "It is in Newcastle's favour that no club in the Premier League era has won three of its first five games and been relegated, but Benitez is too experienced to cling to that statistic. He said: "With Napoli in the Champions League, we had 12 points and we were out on goal difference, so I will touch wood, and hopefully we will be fine."